1) Look up the word widower. Write out it's meaning. 2) What does bigot mean? 3) Find the word fanatic. What is today's simple meaning of this word when used as an adjective? 4) Look up segregate. What part of speech is it? List the first meaning for segregate. Go to To Kill a Mockingbrid Then and Now. Click on historical archives and then on The Author and The Book. 5) List 5 ways in which Harper Lee's childhood and Scout Finch's childhood were similar. 6) Scroll down through the time line. 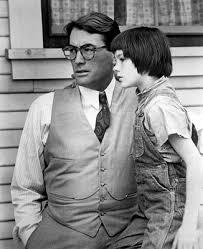 When was the film version of To Kill a Mockingbird released? Go to Harper Lee Bio. 7) Harper Lee was educated to be a _________________? 8) BUT she worked for the airlines as a ________________ until she began to write full time. 9) What sacrifices did Harper Lee make in order to pursue her desire to write? 10) Harper Lee has homes in what two American cities? 11) List three of her published articles. 13) Why did blacks leave the country for the towns and cities? 14) What was the pay in the 1930's for Mrs Barge's father...when he had work? 15) List two possible occupations for black males and two for black females in the 1930's. 16) Could black citizens vote in the 1930's? 17) What is the final quote that Mrs Barge says? Page Last Updated: 9/23/2009 | A FREE website by EducatorPages.com™ - Get your own! | Concerns about this page? Please let us know.